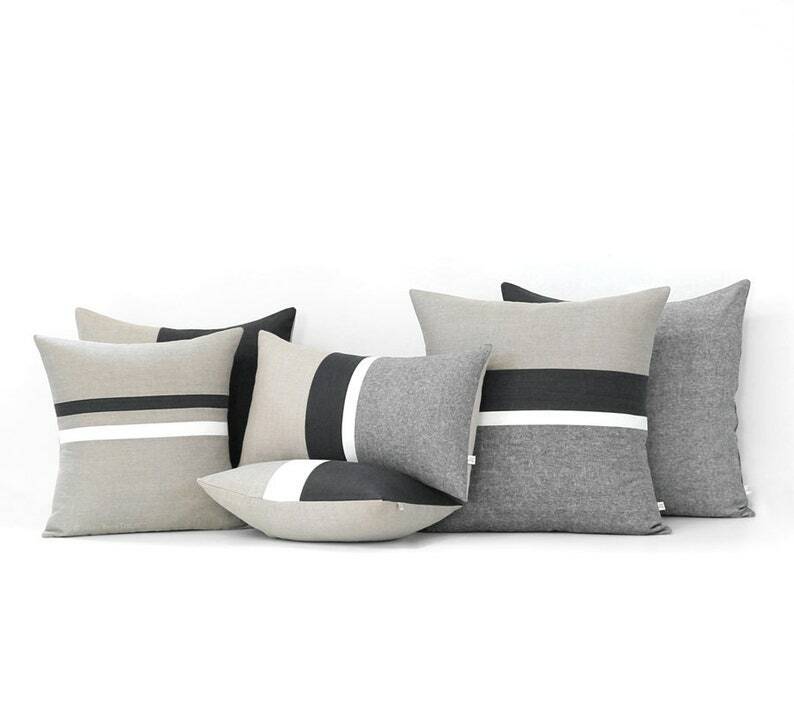 NEW :: Black Striped Linen Pillow Cover Set of 6 in Black Chambray, Black, Cream and Natural Linen. We've combined our new and most popular styles in one beautiful minimal look. 6 total. This set will make your living room complete with the endless mix & match options. If you're interested in a customized set please don't hesitate to contact us! Original designs by artist and interior designer, Jillian Carmine. (1) Chambray Colorblock Pillow Cover: 20"x 20"
- Front: Black Chambray and Black Linen. - Body: Navy Linen with envelope closure. (1) Chambray Striped Pillow Cover: 20"x 20"
- Front: Black Chambray, Black, Cream and Natural Linen stripes. 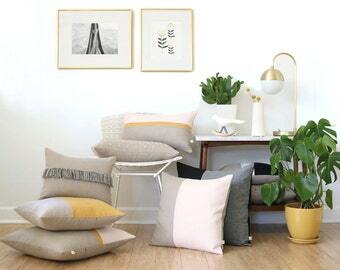 (1) Chambray Striped Pillow Cover: 12"x 20"
(1) Colorblock Pillow Cover: 12"x 16"
- Front: Black, Cream and Natural Linen colorblock stripes..
(1) Two Tone Colorblock Pillow Cover: 18"x 18"
- Front: Black and Natural Linen. (1) Striped Linen Pillow Cover: 16"x 16"
- Front: Black, Cream and Natural Linen Stripes. - Body: natural linen, 100% linen. JillianReneDecor™ Copyright 2012-2019. All rights reserved.